Beekeeping chat - Off Topic - Drive On Wood! Not sure you ever mentioned bears as your neighbours. The Slovenian, or shuld l say Slavic in general) word for bear literaly translates to “honey finder”. Luckly none of those here. Yet. We had terible weather last couple of months. Rain allmost every day, cold temps. Decided to check on the hives today. 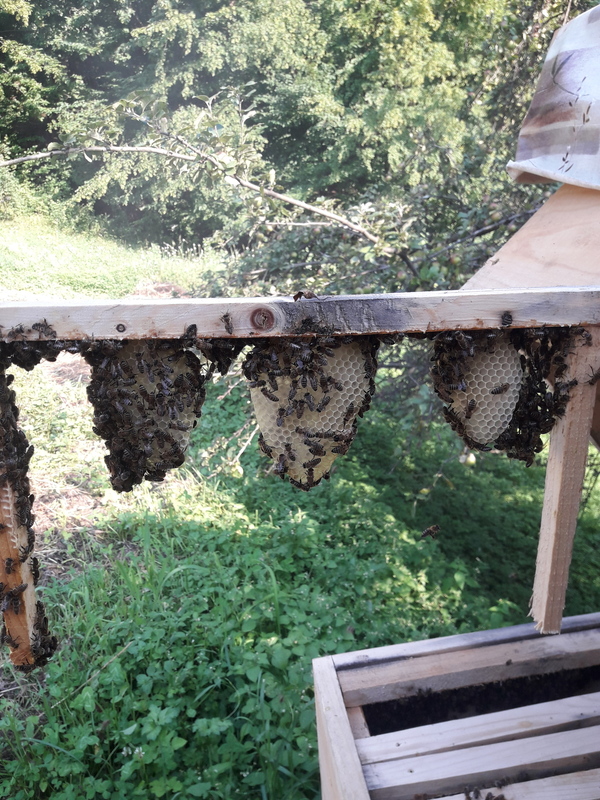 Conclusion: hives are strong and healthy, no sign of varoa, full of brood, but no honey. Each of the 2 hives have maybee 4 pounds. Thats not nearly enough for them to survive so l think its time to start feeding them sugar. Well, here are some pics. Enjoy. It absolutely amazes me how much precision those flea size brained criters are capables. They start building on 3 separate places, and come together flawlessly. Well done Kristijan! Your bees look healthy. Yes, feed them sugar. I’m sure you can sneak a little honeycomb away from them later for sampling! I took a comb about a month ago, when they had good stock of it. Got about 2 pounds of best tasting honey l ever ate, but now l allmost feel bad for taking it. Poor girls are on the edge of starving. Polen suply is good thugh. Can this “sugar honey” still be used for consumption? It just does not taste like honey, let your bees keep it. It never gets that golden color. The bees will have other food sources (late blooming flowers like corn flowers and asters) through the fall. The color gets darker and perhaps a more bitter flavor. Just check on them once in awhile, you may not have to feed them continuously. I read feeding bees outside the hive is not advised. Is this true? 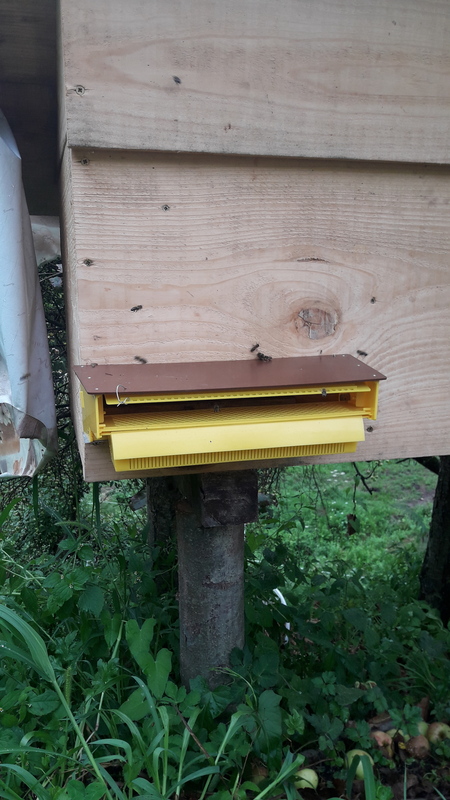 The old hive has a built in feeder but the toptopbar does not. I set this up yesterday. 2 gal of syrup in a cheeckhen waterer with some paper towels in. About 200 feet from the hives. WOW it got crowdy! Unbeliveable how fast they emptyed it! I think the only problem feeding outside the hive is unwanted guests. Wasps, ants, skunks, other hive’s honeybees, etc. Easier access for you! Feeding in cold weather / Winter is best done inside the hive for easy access for the bees. 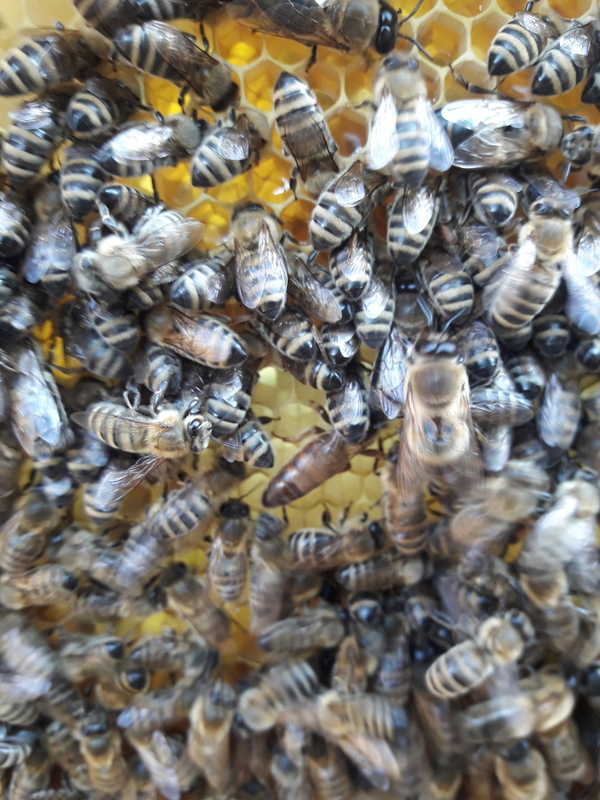 Keepers have used high-fructose corn syrup bought in bulk in a top of Langstroth hive feeder, for those with many hives. 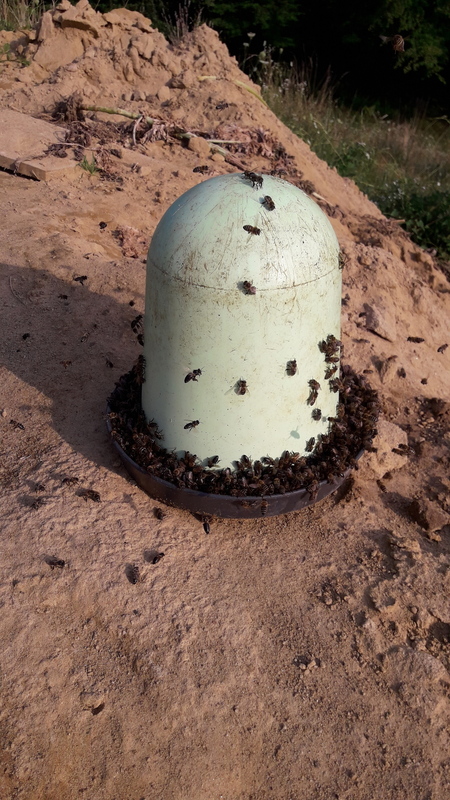 There are also feeder tanks that hang like a hive frame. You could make that. There must be a way to keep bees from drowning. My son Luke won first place at the 4H public speaking competitiion this week. Here he is with his great-grandparents and his trophies. His speech was about liability shield laws for beekeepers. He was going to take some pics of his honey today, but the rain came in quick. He said he has 4 full supers in one hive to extract. I’ll try to get pics of that. Actually, I think we have the speech on video. I might try to upload it to youtube, but it takes a long time to upload videos here. why do you feed your hives at this time of the year? the honey is it already finished at your place? Congradulations to Luke! Wuld love to see what his workers produced! We had terible weather from midle of May. Showers each day and not much sun. Bees werent been able to fly on most days and when they did, they culdnt collect much nectar becouse the rain washed it all. When l checked the hives about a week ago they each had lots of polen and brood but maybee just 3 pounds of honey each. In a normal situation the hives shuld befull this time of year. I had no choice but to feed them some. Luckly weather is getting better and thime is at full bloom so l hope they make it. I will still feed them on rainy days. Good advices on feeding. It all makes sence. I made some sugar candy and put it in the hives, but it seems they eat it slow. They drink syrup incredibly fast thugh! One other concern l was thinking about is with outside feeders most forager bees atack the feeder so they dont visit flowers in the time the sugar is available. This means they dont get polen. Is this a concern? 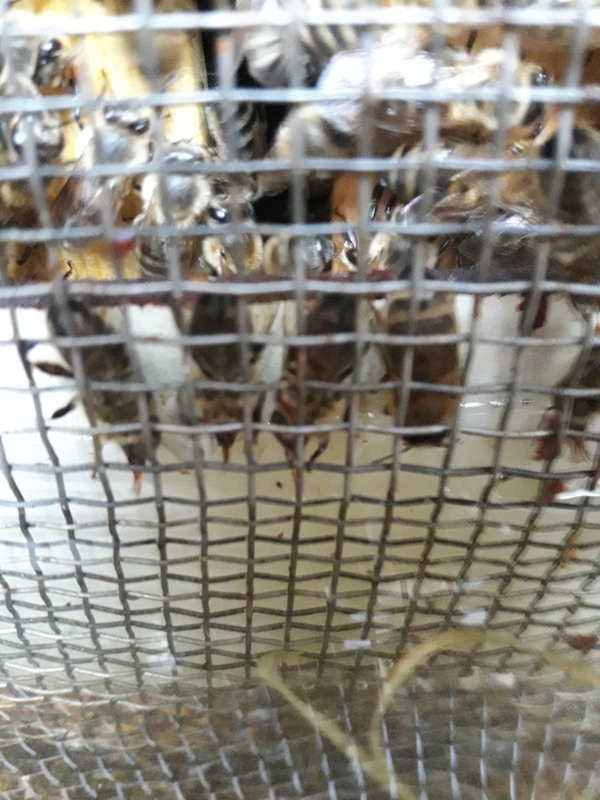 Allso l heard with outside feeders, thereis a danger of hive robbing? Hang it in a tree to keep the four pest out of it. the sugar syrup will probably contaminate the thyme honey. I suggest that you generously feed your hives until thyme is honeyed. Checked the bees yesterday, now thats a different story! A week of good weather and about 10 pounds of sugar did the trick, both hives have good honey stock now. Far from full but they will do well. I stoped feeding them. I recommend that you do not split this time of year. Instead, allow this hive to build up as big and strong as possible going into winter with as much honey as possible. 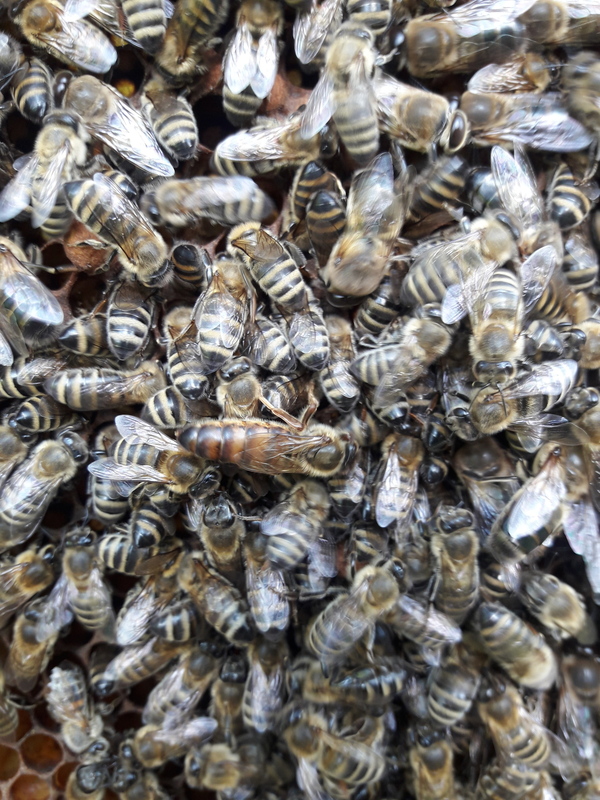 Then if you have a super of honey in February, your spring bee re-population will happen a lot faster and you can have three deep supers full of brood by the end of March. 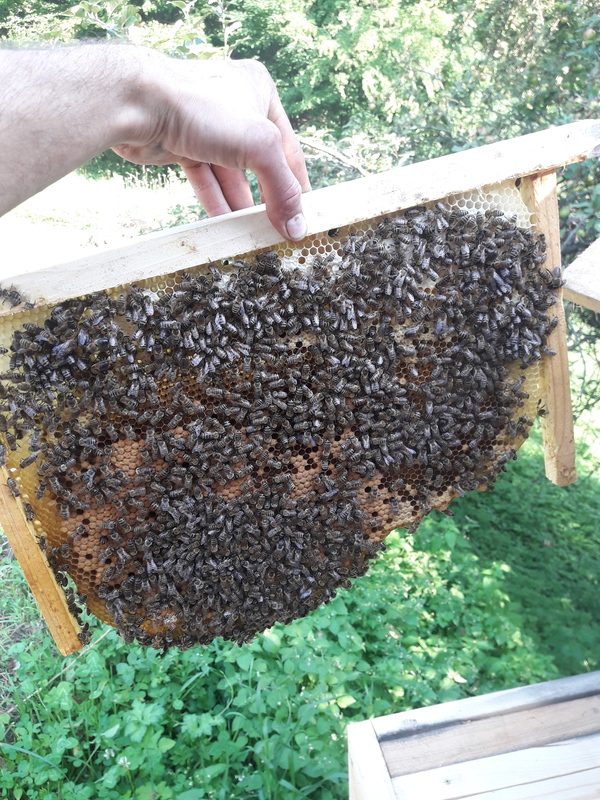 Then you can have several strong, early splits from that hive at a time of year when the weather is more friendly. Instead of the best option now being only possibly two hives from a split. One of which will inevitably be weak and very likely not survive the winter. That is my experience with late season splits. But that is here so I don’t know about bees there. So basicly you prefer quality over quantity. Agree. 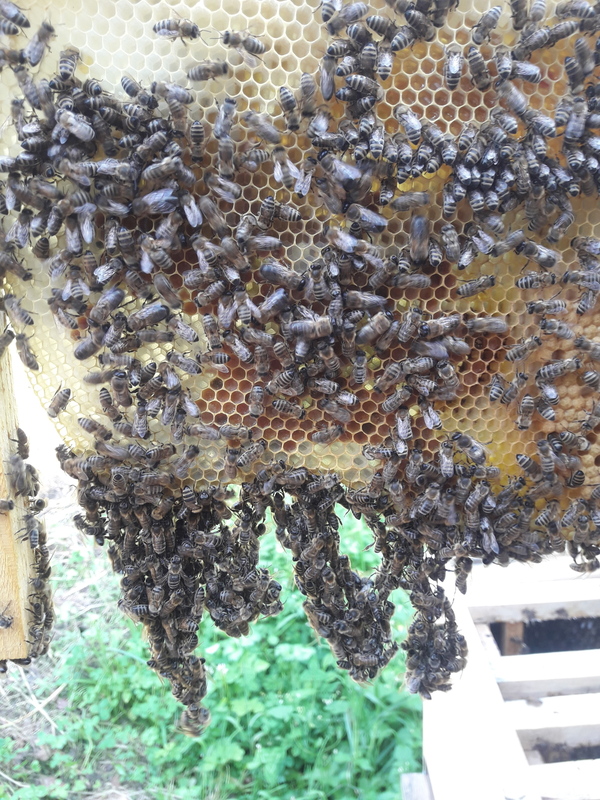 But hey, l figured althugh nectar flow was miserable this year, combs were full of polen. Why not harvest some? Here it goes. Varoa destructor. Saw the first mite yesterday. Any clues, recomendations, from seasoned beekeepers? I have both oxalic and formic acid at home (l am a chemist afterall ) but l read they can be harsh on bees. Is it true? I have no experience with beekeeping, but a quick reading at the internet showed that both acids are used to fight Varroa. I guess it depends on the concentration if they are harmful to the bees. A natural alternative is Thymol. I read that the kind and time of the necessary treatment is dependent on how much mites you count in the hive. There are different methods counting, one quite exact is suing powdered sugar and does no harm to the bees. I’m afraid this was not very helpful as i just repeated what everyone can read in the web. I will leave the discussion to the bee-experts now. Good luck with your bees! First, sorry about your bee’s mite problem. I have not used a mite treatment. I found an article in “Bee Culture” that might help with the different acid treatments. 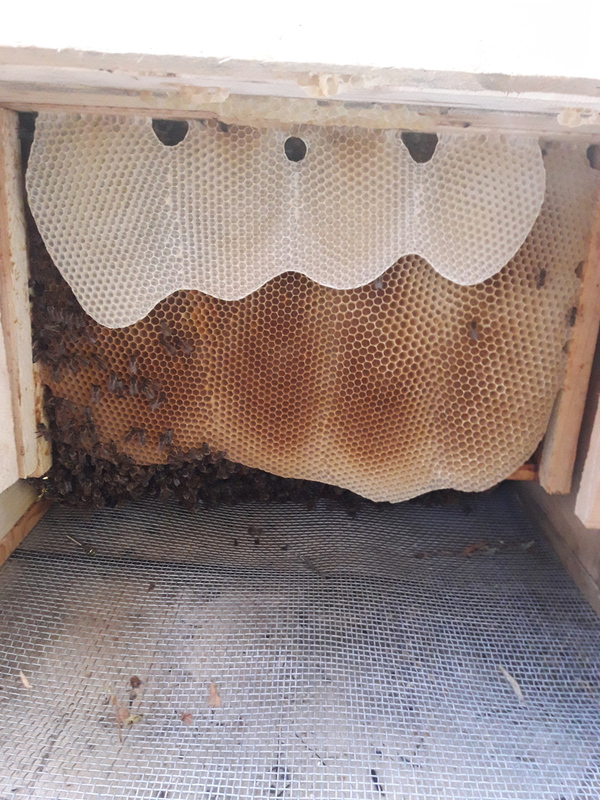 I know some beekeepers are breeding bees that have good “grooming” behavior, they pull the mites off and keep working, I don’t know if you have a screened bottom board in your hive, so that the mites, once off the bees, can’t climb back up to the brood area, or a shallow tray of food-safe oil on the bottom board for the mites to fall into. (or both, oil tray under screen).